Henri Hess, the inspired artist from Eindhoven, a town in the Netherlands, couldn’t have wished for a better introduction. His working method is a reflection of the way he speaks: direct, uncomplicated, and colorful. His paintings are redolent of the pleasure he finds in his work. Rural views, landscapes, water gardens, still-lifes, and portraits are all painted with a great power of expression. 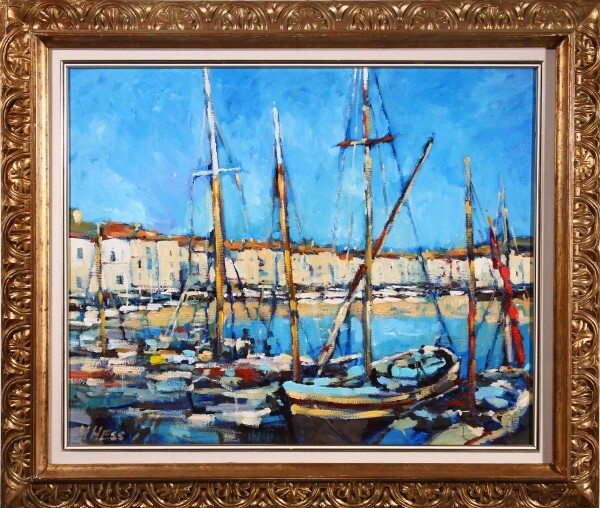 The collection of well-balanced art works by Henri Hess clearly justifies the reviving interest in contemporary masters. The daughters of the family in which Henri Hess grew up were traditionally trained for a position in the service industries and the sons were sent to a lower technical school. A different kind of education was simply unthinkable. At a very early age, however, Henri Hess showed the makings of an artist. He spent most of his leisure time drawing. In school, during biology class, he was the one student who could draw a beetle on the blackboard. In technical school, his drawings of voluptuous nudes proved to be popular objects of exchange among his schoolmates. As a trained carpenter Henri was employed by various regional companies. Henri attended evening classes to further his education and, from 1967 on, he studied painting and life drawing at the Stichting Kunstzinnige Vorming (Foundation for Art Education) in Eindhoven. Then, in 1972, he realized what he wanted to do with his life and converted the garage next to his house in Geldrop into a painter’s studio. Due to a number of local exhibitions his reputation as an artist has been growing steadily from then on. At one of these exhibitions he met the painter Frans Manders with whom he worked for some time. Together they set out to depict the Brabant landscape and together they traveled on a study tour to Paris, Normandy, and Auvers-sur-Oise, the village in which Vincent van Gogh, whom Henri Hess has always admired, spent the last few months of his life. In the open air, wandering past farm houses and along the banks of the river Dommel, enjoying the view of wooded banks and distant horizons, Henri sketches and paints the images that inspire him. Characteristic landscapes with dramatic skies carried out in a solid style full of deep tones and shades of color and featuring a sharp contrast of light and dark. The calm of nature makes his paintings breathe a sense of security. The summary and autumnal landscapes painted in typical earth tones are impressive. Views of villages and marketplaces and some of the still lifes evoke the melancholy atmosphere and mood which are so typical of Hess. Hess is a master at painting an impression and even more so at depicting multi-hued cloudscapes. He knows how to combine soft colors with pale blue and stark white tints. By painting layer over layer he can create an extraordinary three-dimensional effect. In his work he expresses his love for the area on which he lives. To those who know the artist’s earlier works, the development in Hess’ more recent works will come as a surprise. Instead of his customary dark, somber colors, there is a profusion of bright, cheerful tones, reminiscent of the French impressionists. His technique has changed, too. Now the brush has become more important to him than the palette knife. On his canvases Hess captures the light most superbly. Although his paintings are representational, there is an unmistakable search for abstraction in his most recent paintings and watercolors; the composition and color scheme of which are incredibly powerful.